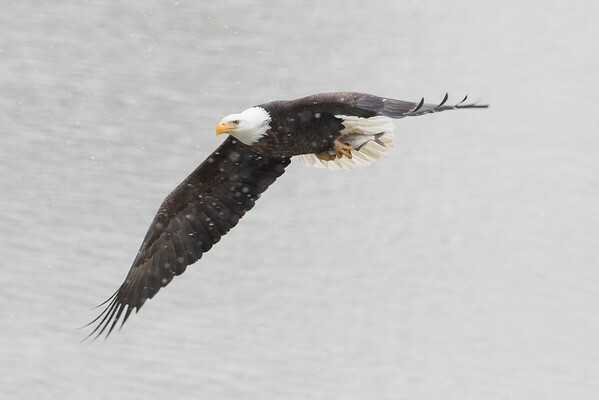 Tuesday afternoon I went back down to the Wabash River to see if the eagles were out again. Boy were they. At first I counted 13 eagles up in the trees around the small pond just off of the river. That was before a resident of the apartment complex next to the pond let me know that there were two eagles in the trees just off to my right. I went up and made some close ups of the eagles as they sat a few feet from me. In fact I had to back up a bit to fill the frame with the eagles. I went back to my position that allowed me an obstruction free look at the pond when the eagle that I had just photographed took off down to the water. I quickly found it with my camera and made this shot as it made its getaway with a fish. This really is an amazing thing to see in person. 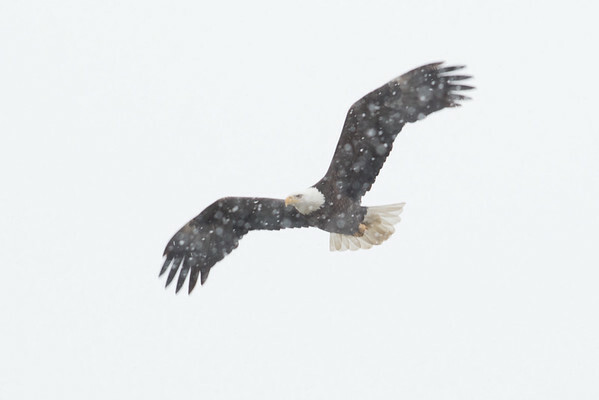 With the snow coming down and the eagles flying around it really made for a fun time at the river. Both days that I have gone down to the river to see the eagles I have made some photos that I was happy with right off the bat. I would chimp at my screen and smile. There is that moment though when you make the shot where you want to do a little dance. When the eagle came out of the water with the fish was that moment for me. The angle was wrong to get the actual catch, but as the eagle flew away I was given a nice view of the fish in the grasp of the talons. Sometimes just waiting that extra bit longer can payoff. Here I think that it did. For the last couple of years I only saw the eagles from afar. When this little pond freezes over they head somewhere that I do not know about. That can be really frustrating. Maybe that is why I have gone back so much this year. You just never know when the eagles will leave, and if they will even come back in the numbers that they are here now. If you live in the Lafayette area it is worth a look for sure.